You may be familiar with Scottish bothies but did you know there are eight bothies tucked away in the Welsh hills? Whilst hiking in the most remote places in the UK, you may not expect to find 5* accommodation or a camping site along the way but what you might find is a Great British Bothy. A form of shelter or accommodation with minimal or next to no facilities, it's free of charge and doesn't require a booking system - but you do have to beat others to a bed! Use them as checkpoints, lunch pitstops, over night stays or just for sitting down and airing your socks for an hour; adventurers in the wild tend to appreciate these four walls for something, whatever it may be. All mountain bothies are a no vehicle access area, most aren't equipped with fuel or water sources and nearest towns are generally miles away. 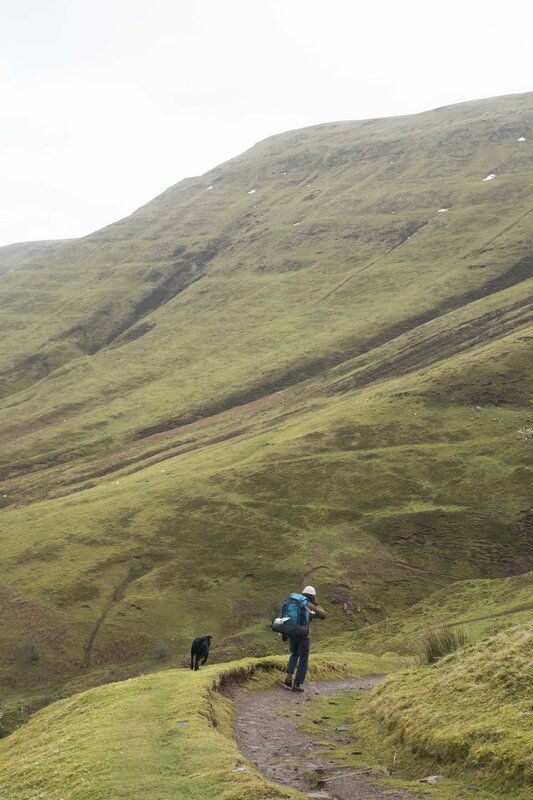 We particularly like the look of Arenig Fawr in Snowdonia and Grwyne Fawr in the Brecon Beacons. Both situated in the midst of unspoiled and vast natural landscape; home to some of the most beautiful mountainous scenery in Wales. We came across a great article recently on The Peel, written by Ivan Kilroe and featuring some beautiful photography documenting a hike to Gwyrne Fawr bothy. Travelling from the north as we were, you would be forgiven for missing the structure nestled at the mouth of the reservoir. Fortunately we had seen a few pictures of the shelter beforehand and could work out its position in relation to our surroundings. Grwynn Fawr is a particularly small bothy overlooking the reservoir and sleeps a maximum of three people (cosily) on a mezzanine sleeping area. Its size means there is always the gamble of it already being occupied, so we made sure to be there extra early on in the afternoon to avoid disappointment. It would have been particularly unfortunate after carrying such a heavy bag of logs over the 4 mile route to be met with an already occupied bothy. Of course this would be a great present for the residents, but fortunately our efforts were rewarded and we secured the occupancy. Inside the bothy there is a singular rectangular window that doesn't let much light in on a grey and overcast day like today, a miniature table, stone bench, chairs, and a small but exquisitely crafted stove that tapers into the flu. We turn to the torches and headlamps to provide some illumination while we fix ourselves a wee dram of whisky to keep us going. The cold white light of the LED's does little to make the space feel homely, but once the fire is underway the bothy is transformed, and a warm comforting glow penetrates the dark corners of the room as we start to feel quite at home in this quaint little building nestled in the Welsh countryside. Whenever I describe this kind of trip to someone who has no desire to do a trip like this, I'm often met with confusion and a complete lack of understanding as to the why? It's sometimes hard to convey, and I completely understand their sentiments when you describe the somewhat unappealing wintery scene. But there's something in being away from the distractions of modern life and all its convenience that makes me appreciate a few slightly burnt sausages in-between two slices of bread in a dimly lit room with a good friend and a dog sipping whisky into the night.